Rev. Jaganath, Integral Yoga Minister and Raja Yoga master teacher, has spent a lifetime delving into the deepest layers of meaning in Patanjali’s words within the Yoga Sutras. Our series continues with the 34th–39th sutras of Chapter 1. In sutra 1.33, Patanjali described how we can cultivate “citta-prasādanam,” a calm and clear mind. A calm and clear mind is a prerequisite in order to be established in the goal of Yoga: Self-realization. How can we see who we truly are, without a peaceful mind to clearly reflect the Self? 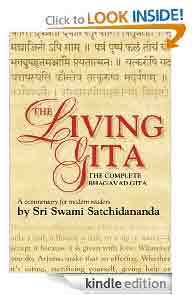 Thus, in sutras 1.34–39, Patanjali continues to describe various ways to cultivate citta-prasādanam and these truly showcase his universal approach—a hallmark of yogic science of mind. Or that calm is retained by the controlled exhalation or retention of breath (Swami Satchidananda translation). Or by smooth, regulated exhalation and by retention of the breath (Rev. Jaganath translation. This word generally comes immediately following the word to which it refers. Or the concentration on subtle sense perceptions can cause steadiness of mind (Swami Satchidananda translation). Or clear steadiness of mind is attained when focus on a sense object causes a subtle sense perception to arise (Rev. Jaganath translation). Pravritti can mean spiritual engagement and creating a self-identity based on material, tangible factors. Nivritti means spiritual disengagement from worldliness and self-identity based on that which transcends the world. Yoga teaches a balance, or better yet, the intrinsic harmony between these two apparently conflicting orientations. Manas, most often translated as mind, does not represent the totality of the mind (citta is the word for the totality of the mind). Manas, closely associated with the senses, is one of the three basic functions of citta. It is that aspect of individual consciousness that takes in impressions as part of citta’s effort to discover which objects and situations are pleasant and which bring pain and suffering. The impressions taken in by manas are directed to the buddhi (intelligence, discriminative faculty) which categorizes the impressions it receives. When the mind is peaceful, clear, and one-pointed, buddhi acts as the intuitive faculty, revealing insights into subtle aspects of the universe and self. The third aspect of the mind is ahamkara, the ego sense. This faculty of mind constructs our sense of self by claiming thoughts and accumulated memories and subconscious impressions as the self. The self created by ahamkara is not the Self, Seer, or Purusha, but the body/mind misperceived as the Self. In Buddhism, manas is considered almost like a sixth sense that is suited for rationality, the quality of being able to think logically; the ability to reason. It is similar to the tongue being suited for taste, the ears for sound, etc. Or by concentrating on the supreme, ever-blissful Light within (Swami Satchidananda translation). Or by contemplating the supreme radiant light in the heart that is beyond sorrow (Rev. Jaganath translation). From the fear of death to the knowledge of immortality. from jyotiṣ = light (of the sun, dawn, fire, lightning), brightness (of the sky), the light that illumines the three worlds, flash of lightning, moonlight, eye-light, the eye, astrology, celestial world, intelligence, light as the divine principle of life or source of intelligence, human intelligence, highest light or truth, light as a type of freedom or bliss or victory + matī = devotion, prayer, worship, hymn, sacred utterance, thought, design, intention, resolution, determination, inclination, wish, desire, purposely, to set the heart on, make up one’s mind, notion, idea, mindful, respect, perception. As a suffix, it indicates the possessive adjective. Light is a universal symbol of wisdom, knowledge, the soul, the Absolute, and God. We experience light as that which allows us to see objects, people, and physical pathways. That same light, but on a much subtler level, is consciousness, allowing us to perceive our thoughts. It would certainly be correct to frame the entire Yoga life and its practices as a way of discovering that our innermost self—the Seer—as light. Vedic sources present the idea that there are three suns: in the sky, in the eye, and in the heart. There are a number of interpretations that can be derived from this; one is that all three suns are manifestations of the principle of awareness: the power of perception. The sun and eye allow us to perceive physical objects, the heart allows us to “see” — understand, feel, communicate, connect, and hold spiritual truths. We can interpret jyotishmati as the Purusha, the light in the heart that is beyond sorrow — duhkha. See 2.20. Or by concentrating on a great soul’s mind which is totally freed from attachment to sense objects (Swami Satchidananda translation). Or by contemplating the state of a great soul’s mind that is free from attachments to sense objects (Rev. Jaganath translation). Or by concentrating on an experience had during dream or deep sleep (Swami Satchidananda translation). A dream whose impact is striking and remains in the mind upon awakening. It could be a teaching or the experience of the visitation of a divine being. The tranquility that we experience from a good deep sleep that is recalled on awakening. This tranquil state provides a taste of the peace of the Self. The sense of individuality that persists through deep sleep and the other states of awareness: dream and the waking state. There is a fourth state of consciousness, turiya, the superconscious state experienced in the highest samadhi. Refer to 1.9 for more onjnana. Or by meditating on anything one chooses that is elevating (Swami Satchidananda translation). Or by meditating on any suitable object that inspires you (Rev. Jaganath translation). Reviewing the roots of the word, we find an image of holding and maintaining. Meditation really begins in earnest when the mind learns to embrace, hold, and nurture the object of meditation. Refer to sutras 3.1 – 3.12 for information detailing the progressive stages of meditation.